Here's the interesting thing about paid search. If you don't execute catalog marketing programs, and if you cut way back on your email marketing contacts, you stop driving traffic to Google. And when you stop driving traffic to Google, you stop paying Google. And when you stop driving traffic to Google (and Amazon), e-commerce-only businesses and retailers suffer. In other words, if you are going to come up with the appropriate catalog + email contact strategy, at a customer level, you have to factor in the impact of catalogs and emails on paid search. How catalogs drive volume to email. 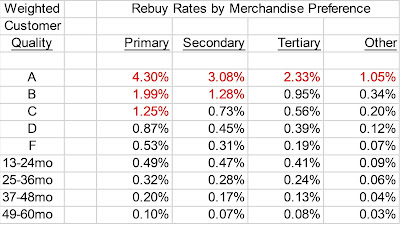 How email campaigns cannibalize catalogs. How catalogs drive traffic to Google, traffic you have to pay for a second time. 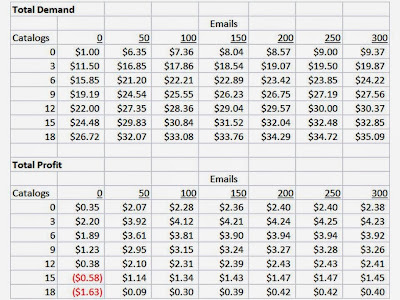 How emails drive traffic to Google, traffic you have to pay for a second time. After we account for each factor, we get the "Total Demand" grid outlined above. 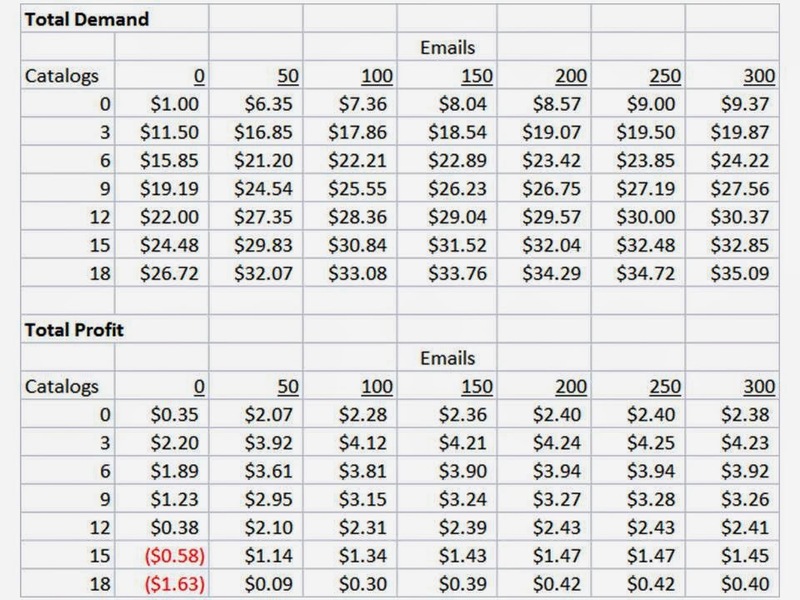 And after factoring in catalog costs, email costs, and paid search costs, we get the "Total Profit" grid. Which strategy is most profitable? 250 email campaigns, same as last year. This is the direction my projects are heading in, during 2014. A handful of lucky clients got to beta-test this technique at significantly reduced rates in late 2013. 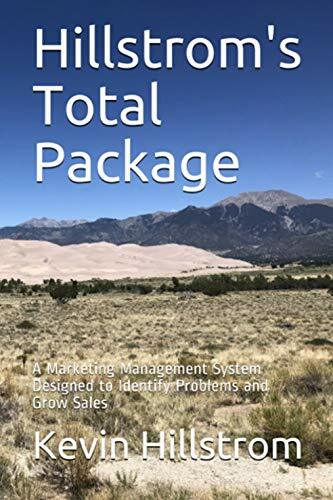 Now I'm diving in, head first, by assigning the optimal contact strategy, at a customer level, based on an evaluation of every combination of catalog contacts and email contacts, factoring in the impact of each contact strategy on the paid search budget.